Situated right on the seafront in Tywyn between, Aberdovey and Barmouth, west Wales, these two-bed self-catering apartments offer uninterrupted views of Cardigan Bay to the west and the valleys and hills of Bro Dysynni, which form the south-western corner of the Snowdonia National Park, to the east. If you are looking for a holiday in Wales, then Tywyn represents an ideal location to explore the best of what this country has to offer. The area is renowned for its natural beauty providing an ideal location for walkers, cyclists, climbers, fishing, surfing, sailing, kite boarding, bird spotting, golfing, and horse riding. Craig yr Aderyn, in the Dysynni valley, is a popular site for climbers offering 35 different routes of varying levels of difficulty. Is a gentle walk more your scene? There are a myriad of marked trails nearby which will appeal to both the enthusiast and those seeking a more family-friendly experience. The nearby Dolgoch Waterfalls and Broad Water Lagoon have always proved popular with visitors and the famous Talyllyn Railway and Railway Museum is only a short walk from your holiday apartment. If a more relaxing holiday is what you have in mind, then you may be interested to learn that the name Tywyn is derived from the Welsh words for beach or dune and Tywyn does not disappoint, boasting a Blue Flag beach (www.goodbeachguide.co.uk) which stretches five miles to Aberdyfi in the south. Keep an eye out for dolphins and porpoises - it's not unusual to see them on a daily basis in pods of up to 20 from early Spring through till Autumn, and so prepare yourselves a picnic, from your own self-catering apartment, and stake yourself a spot on the beach. Do you have little ones to keep amused? Tywyn's leisure park is right behind the apartment and there is a children's play area next door together with a tearoom. So grab yourself something warm to drink, and maybe a snack, and sit and watch as your children burn-off some energy. Whatever your holiday plans, we have it covered. tywynholidays.co.uk 5 out of 5 1 based on 80 reviews. See all our reviews by visiting our Testimonials page. We had a great time in Tywyn and enjoyed a nice and beautifull flat with perfect service when we had any questions/problems. -Hope to be back in the coming years! the apartment was very clean, tidy and welcoming. it had everything we needed and more. Very nicely decorated and furnished apartment. The double bed was really comfortable, it felt like it had a modern memory-foam mattress. If you keep the bedroom window open a little, you get the soothing sounds of the waves breaking through the night. I've been a chronic insomniac for about 20 years and had the best 3 nights sleep here that I've had in a long time! The apartment was comfortable and well equipped with everything needed for a perfect holiday. The location could not have been better, a stones throw from the beach, and the views from the bedroom were outstanding, especially the lovely sunsets. 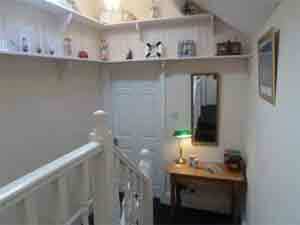 We would highly recommend this apartment as somewhere to stay on a visit to Tywyn and would love to visit again. Check our availability or use the Enquiry Form. We have a double and a twin room with a guest bed and can sleep five. Fridge, Freezer, Digital TV, DVD Player, Electric Radiators (number 18) / Storage Heaters (number 17), Oven & Hob. Off-road private parking at rear of property. Provided but please bring your own towels. Smoking is not permitted anywhere in the building. Wi-Fi is available in both apartments. We haven't forgotten. We are right next to the beach! The video below showcases the magnificent golden strand between Aberdovey and Tywyn. Trem Enlli makes an appearance at 5.30 minutes. Please note that both apartments are on the third floor and Trem Enlli does not benefit from a lift. Unfortunately, our lease does not permit us to accommodate pets. Sorry! Copyright © TywynHolidays.co.uk All Rights Reserved. No part of this website may be reproduced without TywynHolidays.co.uk's express consent. Backlinks are allowed.